BMW had only been building motorcycles for a few years when the world’s economy crashed. Sales of the premium tubular-framed, air-cooled flat-twin “Beemers” cooled, and BMW seized on the opportunity to reintroduce a small single to the market. Timing and design were perfect, and the R2 quickly became a people’s favorite. 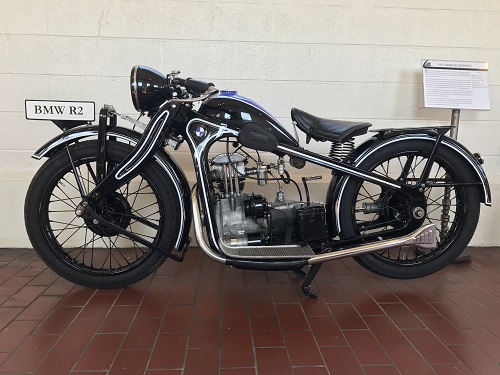 BMW’s smallest displacement bike to date, the R2 used a 6hp, 198cc air-cooled four-stroke single, combining it with features found on the some of their premium bikes – shaft-drive and a pressed steel frame combined with recognizable styling. 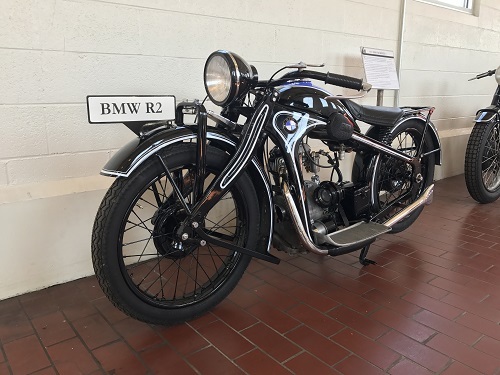 It shared the inexpensive singles market with the larger R3 and R4, 305cc and 400cc, respectively, but the R2 enjoyed another advantage: being under 200cc, it was exempt from many taxes and licensing regulations, making it even more affordable to the public. The R2 saw small improvements each year of production – in 1932 the valve springs were covered, in ’33 a steering damper added, in ’34 an upgraded Amal carburetor replaced the SUM carb, and so on. By the end of production, the R2’s power had been increased to 8hp! That sounds ridiculous, but think about it – that’s a 33% increase in power! While the R2 series was a huge success, its larger, more powerful siblings easily outsold it once the economy recovered. During the six years of depression, the R2 sold 15,207 bikes; in 1937, the 750cc R12 sold over 10,000 in a just one year. This particular bike was built on October 30, 1931, and was delivered to Schäfer BMW in Neustadt-Orla in March 1932.